Russet Street Reno: CSN Giveaway Winner! 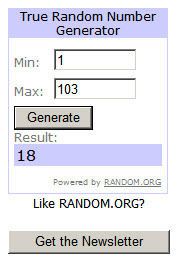 The Random.org Gods have spoken, and self-proclaimed 'lucky' girl Cassie from Primitive and Proper is the winner of the CSN gift card! i am feeling lucky! :) i am enjoying your blog and thanks for the chance to win! Thanks to everyone for your comments. I love finding new blogs via my comments, so PLEASE make sure your profile is visible to the public and there is a link to your site. Smooches!! thank you so much, sara!!! i am so excited and can't wait to browse! big fat tease!!! i saw my name and got excited...then saw it's the 'other' cassie. it's a good thing I know and like her. thanks for the chance, sara!